* The Daily Times will not comment further on the article at this time. The Daily Times is published from two major cities in Pakistan, Lahore and Karachi and has a combined circulation of 60,000 copies on week days and 75,634 copies on Sundays. According to a survey carried out in 9 major cities of Pakistan, Daily Times is very popular among high income groups. Former US president Bill Clinton on Friday condemned the publication of Prophet Muhammad’s (PBUH) caricatures by European newspapers and urged countries concerned to convict the publishers. 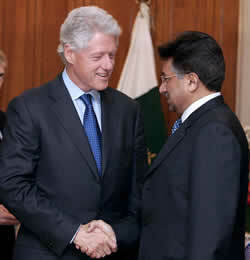 Talking to reporters after meeting Prime Minister Shaukat Aziz in Islamabad, Clinton said he disagreed with the caricatures and that the publication was against religious and ethical norms. Clinton said he had no objection to peaceful demonstrations being held worldwide, but this was not the time for violence. He said it was the time to promote inter-faith harmony and stand together on the issue. He said the people’s religious convictions should be respected at all costs and the media should be disallowed to play with the religious sentiments of other faiths. He said the media could criticise any issue including governments and people, but nobody had the right to play with the sentiments of other faiths. Talking to newsmen here at Prime Minister House along with Prime Minister Shaukat Aziz, former US President said, “I strongly disagree with the creation and publication of sketches.” Clinton said he was the first person who spoke against these blasphemous sketches. He said there is need to promote interfaith harmony the world over and stand together on the issue. Clinton said religious convictions of the people should be respected at all costs and no media should be allowed to play with the religious sentiments of people of any faith. He said media can criticise issues including government, policies and people but no one has the right to play with the religious sentiments. Clinton said people in America have also condemned the publication and they are deeply concerned on it and added they respect Islam as it is fast growing religion in US. After several calls this weekend to the Daily Times, I was referred to Islamabad based bureau representative from the Daily Times who covered the event. The Daily Times staff reporter had no further comments at this time. This was not the first time that Bill Clinton spoke out against the Muhammad cartoons. However, Saturday was the first time it was reported where Bill Clinton spoke about prosecuting Westerners for publishing the controversial Muhammad cartoons. World Net Daily reported this story on Friday. Taking Aim has some interesting questions about this story. Generation Why is wondering who to trust.